Mindfulness training has been shown through extensive research to be effective in improving physical and psychological health and particularly with the physical and psychological reactions to stress. The vast majority of the mindfulness training techniques, however, require a certified trained therapist. This results in costs that many clients can’t afford. In addition, the participants must be available to attend multiple sessions at particular scheduled times that may or may not be compatible with their busy schedules and at locations that may not be convenient. As an alternative, Apps for smartphones have been developed. These have tremendous advantages in decreasing costs, making training schedules much more flexible, and eliminating the need to go repeatedly to specific locations. But, the question arises as to the effectiveness of these Apps in inducing mindfulness and improving psychological health. In today’s Research News article “Efficacy of a Mindfulness-Based Mobile Application: a Randomized Waiting-List Controlled Trial.” (See summary below or view the full text of the study at: https://www.ncbi.nlm.nih.gov/pmc/articles/PMC5770479/ ), van Emmerik and colleagues recruited adults who had an interest in mindfulness and spirituality through social media and randomly assigned them to either a mindfulness App group or a wait-list control group. 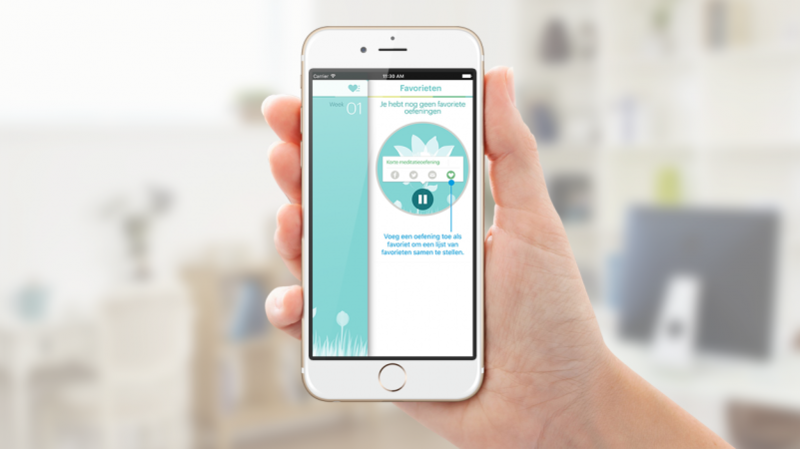 The mindfulness App participants were directed to download from the App Store of Google Play Store the VGZ Mindfulness Coach App and complete the 5-week program consisting of 25 exercises including “breathing exercises, attention exercises, body scan exercises, guided meditation exercises, visualization exercises, mantra exercises, and yoga exercises.” The participants were measured before the program and 8 and 20 weeks later for mindfulness, including the observing, describing, non-reacting, non-judging, and acting with awareness facets, quality of life, including physical health, psychological health, social relationships and environment, psychiatric symptomology, self-actualization, and satisfaction with the App. They found that the App produced large significant increases in mindfulness including all five facets, psychological health, social relationships and environment, and decreases in psychiatric symptomology. In addition, the participants reported a high degree of satisfaction and engagement with the App. Hence, the mindfulness App group evidenced marked improvement in mindfulness and psychological health. The results need to be interpreted with caution as the study did not contain an active control condition. This leaves open the possibility that the results were affected by biases such as placebo effects, demand characteristics, experimenter bias, etc. Nevertheless, with these caveats in mind, the results suggest that mindfulness can be increased with a smartphone app which may, in turn, improve psychological health in otherwise healthy individuals. This is exciting as the low cost, convenience, and ease of use, of such Apps allows for widespread applicability. This may provide a low-cost means of improving the mindfulness and psychological health of large swaths of the general population. So, improve psychological health with mindfulness smartphone Aps. Although several hundreds of apps are available that (cl)aim to promote mindfulness, only a few methodologically sound studies have evaluated the efficacy of these apps. This randomized waiting-list controlled trial therefore tested the hypothesis that one such app (the VGZ Mindfulness Coach) can achieve immediate and long-term improvements of mindfulness, quality of life, general psychiatric symptoms, and self-actualization. One hundred ninety-one experimental participants received the VGZ Mindfulness Coach, which offers 40 mindfulness exercises and background information about mindfulness without any form of therapeutic guidance. Compared to 186 control participants, they reported large (Cohen’s d = 0.77) and statistically significant increases of mindfulness after 8 weeks and small-to-medium increases of the Observing, Describing, Acting with awareness, Nonjudging, and Nonreactivity mindfulness facets as measured with the Five Facet Mindfulness Questionnaire (Cohen’s d = 0.66, 0.26, 0.49, 0.34, and 0.43, respectively). Also, there were large decreases of general psychiatric symptoms (GHQ-12; Cohen’s d = −0.68) and moderate increases of psychological, social, and environmental quality of life (WHOQOL-BREF; Cohen’s d = 0.38, 0.38, and 0.36, respectively). Except for social quality of life, these gains were maintained for at least 3 months. We conclude that it is possible to achieve durable positive effects on mindfulness, general psychiatric symptoms, and several aspects of quality of life at low costs with smartphone apps for mindfulness such as the VGZ Mindfulness Coach.